Gil "Levi Hawk" Melton Fine Art is offering an incredible motorcycle for sale, a 1999 Harley-Davidson Softail Standard with great-looking custom trim. I applied my Steel Sculpture techniques in creating the motorcycle trim in steel and stainless steel. Some of which was chromed. The front wheel spokes are twisted steel and the solid rear wheel is from a “Fat Boy” Harley. The motorcycle has a stretched tank, Double D exhaust, Stage 2, Evolution motor. The bike is lowered one and one-half inches. The bike was used mostly for shows. 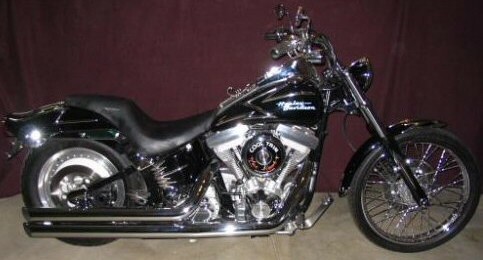 This 1999 Softail Standard has under 4000 miles and stored indoors and used for shows. Contact us for more details and pricing.